You are here:Home » Product Reviews » Snugg Offers Quality Cases For Your Apple & Android Products! Come, let’s take a look at my Snugg iPad 2 Ultra Slim Bluetooth Keyboard Case! It’s lightweight at only 280g, & so easy to set up! No batteries needed as you can charge the keyboard via a USB cable - this is provided as part of the product. Simply connect one end of the cable supplied in the box to the keyboard point, & the other to your PC. A red indicator will come on to show that the keyboard is charging. When the light goes off, it’s fully charged. It's also extremely quick & easy to pair the wireless keyboard over Bluetooth with your iPad. Due to its innovative design, the keyboard is the case! The case combines a wireless keyboard with a built-in iPad stand. This tablet-protecting case is smart, sleek & resilient. With a standby time of 60 days & uninterrupted working time of 55hrs, operating distance of 10 meters means you can even leave the iPad in your regular Snugg case & still use the keyboard! Sleek & stylish brushed aluminium finish that clips onto the iPad as a case. With the Snugg keyboard, typing has never been easier! My fingers fall perfectly onto the keyboard, making typing very natural. The keyboard also has in-built automatic sleep/wake. When it’s used as a case, the iPad goes into sleep mode when case is closed & automatically wakes when you re-open the case. Snugg offers you a range of quality cases for Apple & Android products to customers all over the world. When you buy from Snugg, you’ll also get Lifetime Guarantee for their leather, hemp, silicone cases etc (not clips, swivels or other accessories)! If you own an iPad 4, be sure to check out their crazy coloured iPad 4 cases or their Snugg iPad 4 Case in Electric Blue! Shop now, for your very own Snugg quality Apple & Android cases! 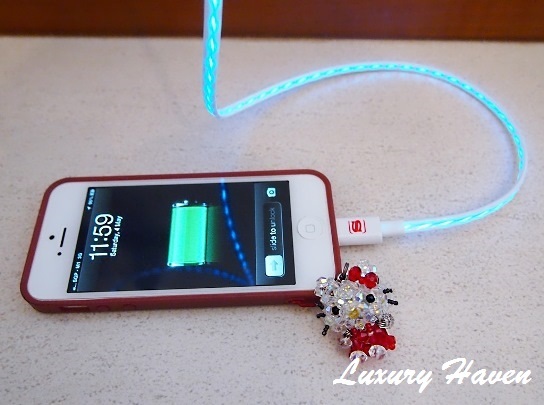 And if you own an iphone, check out my review on Snugg Live Wire Blue Flowing Light Charging Cable for iPhones! Stella, glad u found it informative! Happy shopping! Kathy, exactly! Now I'll have no problem typing when I'm on the go! This is a good accessory. Will let the hubster know! missyblurkit, I'm sure he'll find Snugg cases both handy & chic! Wow! Never expect to be able to get this light weight keyboard at such a good price! And for a wear and tear casing to give life time warranty, i'm sure the leather must be of good quality. DS, love the keyboard! It's even lighter than my current leather case which I've already set aside. Lol! Happy new year shirley....did you see my post as a tribute to you on Friday, sporting my mom's qipao?? Bess, really? U in a qipao at last?? Ok, ok, I'm heading your way now!! tts useful! Slim and light! Need to consider after getting the Ipad soon. Very impressive and nice style. Happy Valentine's Day dear Shirley!! Amy, thks & Happy V-day to u too! Nice product! Thanks for sharing this review, Shirley! Tina, thks for coming by & have a good day! Momto8, thks so much for leaving your trail & will certainly check u out! Hope to see more of u here! Happy New Year to you and your family, Shirley! You have been naughty to make me drool over all your wonderful dishes on FB, Shirley! :D I'm not really cooking this CNY. Enjoying a relaxing one. Btw, I have that keyboard for my iPad. My girl bought for me but have not used it yet. I find using iPad pen is also very convenient and fast. Maybe I should take it out to use. Otherwise one day my girl is going to ask :P It's actually very light and convenient to use. Mary, hahaha! Looking fwd to the day when I can relax during CNY. Thks for sharing your thoughts on gadgets! Hi Shirley, very cool product. I don't use ipad, so I can only feast with my eyes. Will keep this in mind in case I decide to buy an ipad. So glad to meet you, you're a very nice and friendly lady. Your blog always got lots giveaway and happening. You're so blessed, my dear friend. Have a wonderful day ahead. With hugs to you. Amelia, hahaha! 9 comments in a row!! U broke your own record & thks so much for taking the time off. I'm really delighted to meet u too, my dear! Your comments always make me smile! Happy CNY to you Shirley! Michelle, it's extremely lightweight & I love my new toy!! Happy CNY to u too, dear! Hong, awesome gadget I must say!